The picture above is a real electronic sign on Interstate 90/94 heading southbound towards downtown Chicago. I swear it’s not Photoshopped. I couldn’t believe my eyes when my wife pointed this out to me Saturday. I, sitting in the passenger seat, immediately snapped a picture of this and posted it on Twitter to see if any of my fellow Chicagoans noticed this too. 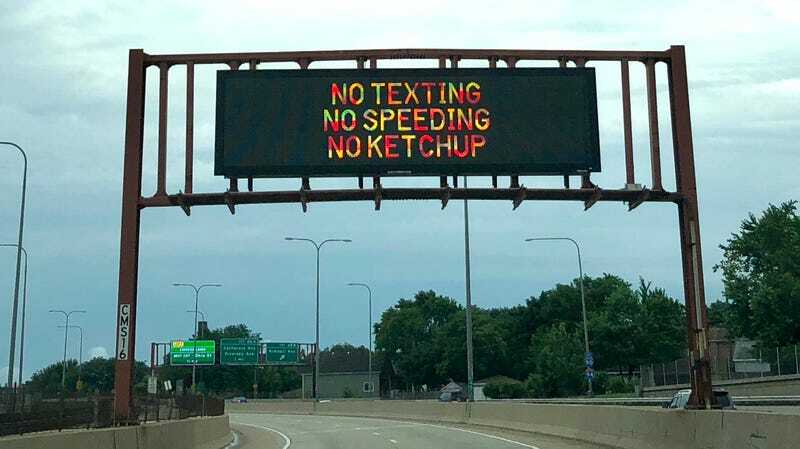 Chicago has this batshit bizarre antipathy towards ketchup. It’s rooted in the fact Chicago has a hot dog with a specific assemblage of ingredients to which no alterations are condoned. Somehow, ketchup got caught in a tangle of cultural mores, and it became a point of civic pride to reject ketchup in all forms. Some Chicago restaurants even display signs that proudly state their establishment is anti-ketchup, not even on French fries, with cheeky counter placards of a red bottle and big X crossed over. I was working at the Chicago Tribune in 2011 when I penned a column arguing Chicagoans should stop freaking out about the condiment, even if it’s cute and wink-wink to do so. Some of the e-mails I received were anything but, unless you believe people asking for your deportation is cute or wink-wink. One of the more puzzling responses was, “you weren’t born in Chicago, you’d never understand”—as if the location of where I emerged from my mother’s birth canal afforded me some gastronomic insight. I’m not dense enough to not see some irony coursing through those responses—“Haha look how faux-seriously we take our food laws!”—but it also makes Chicagoans look provincial, silly, and as if our disdain for ketchup is our city’s proudest identifying trait. At this point, trying to reason with anyone about this dumb debate is a waste of breath (my philosophy is “Eat what you want and don’t yuck on my yum”). To me it’s a strange tic engrained in a number of Chicagoan’s DNA, a fun thing to say with your fists pumped, but ultimately an empty sentiment, and a stupid one at that. The biggest unintended consequence? Drivers taking pictures of these signs while flying down the expressway at 70 m.p.h. Yeah, don’t do that.